The photographs of the special colored Tornado, Typhoon, F-15S, F-15C and MRTT have already emerged. On Sept. 23, Saudi Arabia will celebrate the 88th Saudi National Day. 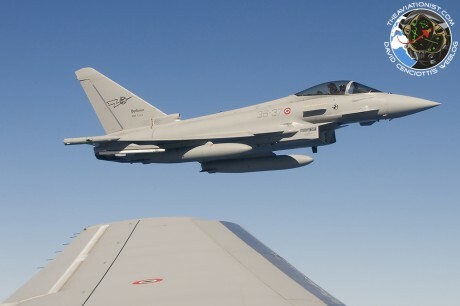 As part of the celebrations, five special colored aircraft (an F-15C belonging to the 13th Sqn; an F-15S from the 92nd Sqn; a Tornado from the 7th Sqn; a Eurofighter Typhoon from the 10th Sqn; and a MRTT belonging to the 24th Sqn) will perform flyovers alongside the Saudi Hawks display team in three cities Jeddah, Riyadh and Dhahran. Our friend @MbKS15 has shared with us some previews of the special painted aircraft. The F-15S belonging to the 92nd Sqn. The F-15C from the 13th Sqn. The Tornado IDS form the 7th Sqn. The Eurofighter Typhoon from the 10th Sqn. All the RSAF involved in the flyovers have taken part in the air strikes in Yemen, as part of Operation Decisive Storm, the Saudi Arabian-led intervention in Yemen, started on Mar. 26 2015. Interestingly, the F-15SA, the most advanced production Eagle ever produced, derived from the F-15E Strike Eagle, was not given a special color scheme and won’t take part in the celebrations (at least not as part of the 88th National Day formation). The “SA” are equipped with the APG-63V3 Active Electronically Scanned Array (AESA) radar, a digital glass cockpit, JHMCS (Joint Helmet Mouted Cueing System), Digital Electronic Warfare System/Common Missile Warning System (DEWS/CMWS), IRST (Infra Red Search and Track) system, and able to carry a wide array of air-to-air and air-to-surface weaponry, including the AIM-120C7 AMRAAM (Advanced Medium Range Air-to-Air Missile) and the AIM-9X Sidewinder air-to-air missiles, the AGM-84 SLAM-ERs, the AGM-88 HARM (High-speed Anti-Radiation Missile) and the GBU-39 SDBs (Small Diameter Bombs) on 11 external hardpoints. The RSAF has received its first of 84 F-15SA at King Khalid Air Base (KKAB) in Saudi Arabia via RAF Lakenheath, on Dec. 13, 2016.